After the tragic loss of Lucy, Fred mentioned he could obtain a polecat Jill from a litter looking for homes, this I thought was a good idea. So it transpired Fred collected three polecat s and asked me to take my pick. This was hard for me to do, so I let one choose me, that was Beryl, who boldly walked up to me. 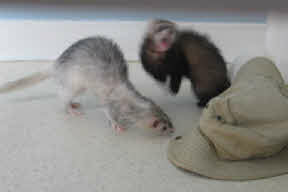 I soon realised she is a very friendly and energetic little ferret, that was to grow much larger. 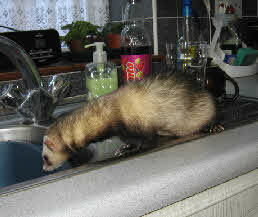 Her father was a large stray Hob found wandering in a woods, who was put into a cage of in season Jill ferrets. When Fred heard of this he told me the Hob must of thought it was his birthday. The result of this error by the keeper was two litters of ferrets. In September 2016 I noticed Beryl was losing weight. At my local vet’ it was found a canine tooth was broken and was subsequently extracted, I was advised that there were probably other issues also regarding Beryl’s health. A urine test showed there were traces of blood present. I was advised that specialist attention was an option, so she was referred to an exotic vet’s. She was retained for a few days at Trinity vet’s for observation while treated. She made a recovery and was placed on medication and was gaining weight. Unfortunately during October the was a relapse, I took her to the vet as she was very ill one morning, but she was dead on arrival. She was 6½ years old. She is buried in the rose bed, a stone paving slab placed over her grave to prevent foxes digging her up.